Voxatron has come a long way since its early days, where it was known as Voxatron Alpha and starred in the Humble Voxatron Debut bundle. In the recent 0.2.1 update, the camera controls were improved among other things, but that’s not the best part by far: The developer added.. a Bullet Hell Elephant! 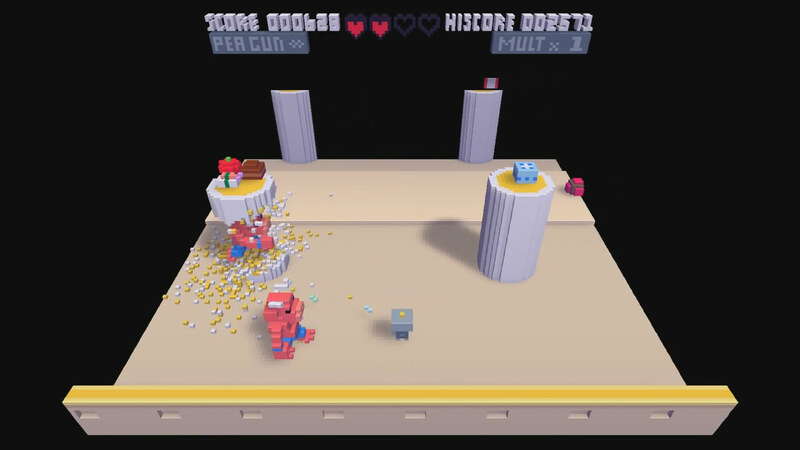 Voxatron is an action/adventure game set in a world completely made of tiny cubes that can be built, blasted to smithereens, and collapse in per-voxel detail. Watch voxel snow settle on the scene perfectly, shoot the voxel leaves off a voxel tree or cut through the trunk and watch the whole thing collapse into voxels. There are lots of voxels in this game. Doesn’t that sound like fun? I think so at least! Maybe even more so because I don’t have a PS3, meaning that 3D Dot Game Heroes won’t be able to satisfy my voxel hunger. And even in this early stage of development, it’s proven to be quite the enjoyable voxel-sandbox title; and the included level editor only makes it better..
And if you’re interested, it’s available directly from the developer (via. the Humble Store, which as always means it’s DRM-free) for $15. For unknown reasons there is no demo available, but be sure to check out the official website anyway, along with the dev’s Twitter, if you’re looking for more information on all things Voxatron.